Kids love playing games. But what if you could design an educational program around them? That’s the impetus behind the After School Enrichment programs at Hex & Company, a natural extension of those started by Dr. Jon Freeman at The Brooklyn Strategist in Carroll Gardens. Below, we discuss in greater detail the various programs, the neuro-developmental basis behind them, the skills your child will learn, and our goals with each. Brain Benders: This program was created based on parental requests. Originally designed for Kindergarteners, it was later expanded to include first graders. The games played in this sequence are designed to promote linear mathematical concepts, working memory, processing speed and enhance perceptual organization. Students learn how to classify an object into more than one category or into one category based on two or more simultaneous properties. Games played in this module predominantly localize the frontal lobes and the parietal cortex in the brain. • Ancient Strategy Games: This sequence focuses on games that promote spatial and perceptual processing as they relate particularly to stored knowledge and information. The brain areas that are primarily activated are the parietal, occipital and temporal regions. • Classic Card Games: Two areas that define classic card games are short-term, goal driven behavior (e.g., to win, to take a trick, to pass cards to an opponent) and magnitude processing and arithmetic fact retrieval (e.g., performing basic mathematics related to a hand of cards). When considered in this light, there are two brain areas that are primarily involved in these activities: the Intraparietal Sulcus (IPS) and the Prefrontal Cortex. • Modern Card Games: The selected games for this sequence build upon the goal-driven behavior of the classic card games and add in planning abilities (with incomplete information) and item-related error and social processing. As a result, two additional focal brain areas – the ventromedial and orbito-frontal cortex – become activated. In particular, the right-hemispheric portions of the frontal cortex (affect regulation) are being stimulated in this sequence. • Word Games: A fairly extensive literature suggests that the ability to analyze and manipulate language at the level of phonemes is largely dependent on exposure to an alphabetic writing system (as opposed to a biological timetable). Students in this sequence critically think about phoneme structure while working on planning abilities and inductive reasoning as they develop words from letter arrangement, stem completion and free- and associated-recall. The specific brain areas that are highlighted are the anterior cingulate, left parieto-temporal region and the medial temporal lobes. • Empire and Civilization Building Games: The expression of increased neuronal connections and firing in the ventralmedial – and orbito-frontal cortex is seen when an individual can develop a theoretical framework based upon a logical rationale concerning the relationships among the objects or ideas comprising the framework. At the same time, there is a recognition that the arrangement is tentative and is one of many possible arrangements that may be changed upon fresh insights. The patterning that the human mind is capable of doing at this stage is complex and is expressed in many different ways. The cognition required to play these game exemplify the highest order of flexible thinking. • Sporting Games: Although “sports” are the theme of this sequence, the games utilized promote decision tasks that are value-based. Skill sets that require estimating probability, delaying response gratification (e.g., impulse control) and working- and spatial-memory are reinforced through sequential game play. The specific brain areas affected are the Inferior parietal cortex and the prefrontal cortex. Role-playing Games (RPGs): There are a wide-variety of RPGs but, most of them at some basic level, require interpersonal interaction and, to a large degree, cooperation. It is also fair to say that cooperative social interaction is critical for human social development and learning. With this in mind, it is interesting to consider that these classes, now the most popular of all classes, were prompted by student requests and were originally not part of the game module sequence. The brain regions involved in playing RPGs affect the focal regions associated with social cognition, attention, and reward processing. In particular, these are the superior temporal sulcus, the anterior singulate cortex, the right cuneus/lingual gyrus and the right amygdala. 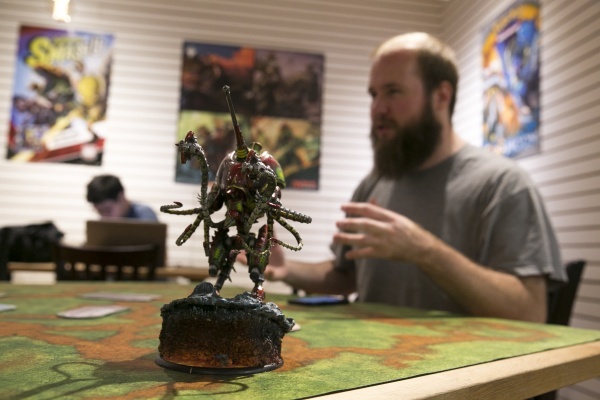 Tabletop Games*: Tabletop games is a general term for just about any game played on a table. 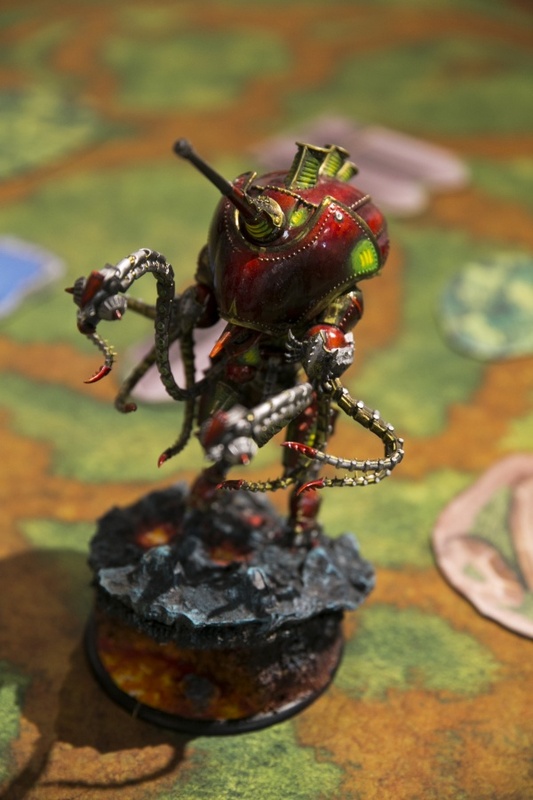 More recently, this concept refers more specifically to games that are played with some form of miniature (or model), dice, measuring tape, complex rules and strategy. These type of hobby-games range from historical reenactments (e.g, civil war, WWI, WWII, etc) to fantasy-based combat. Students that engage in these programs utilize skills that reflect cognitive flexibility (e.g., changing cognitive set), working memory, response inhibition (i.e., delaying action for greater reward at a later point), and spatial orientation. They also draw specific attention to mathematic-based skills such as measuring distance and, at more advanced levels, basic trigonometry. The focal brain regions involved in these games are similar to the activation seen in RPGs and, in particular, the superior temporal sulcus, anterior singulate cortex, ventral striatum and ventromedial prefrontal cortex (e.g., typically involved in risk-reward decisions). 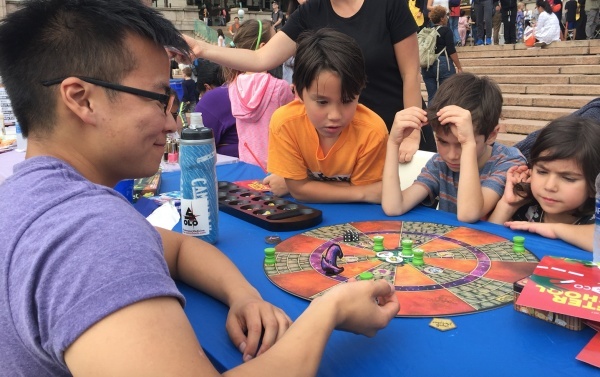 *Due to the complex nature of the rules in these games, students are invited and encouraged to attend weekend club activities (free of charge) as a way of reinforcing rule retention. from June 18th through August 31st. Registration now available- simply fill out this form! Full Week and Individual Day Registration with Full Day and Half Day options available. Play-filled camp for kids entering First Grade and older. Individual Day Sign up (full day and half day) will be introduced in the spring. Individual Full Day Rate: $150.00; Half Days are $80. A 10% discount will be refunded for those purchasing multiple weeks or for those signing up siblings (for a full week). Our morning programming starts promptly at 9:10 am and our afternoon programming starts promptly at 1:40pm, so please have your child here on time at 9am or 1:30pm so that they can fully participate in our activities. Our counselors are American Red Cross CPR/First Aid certified. 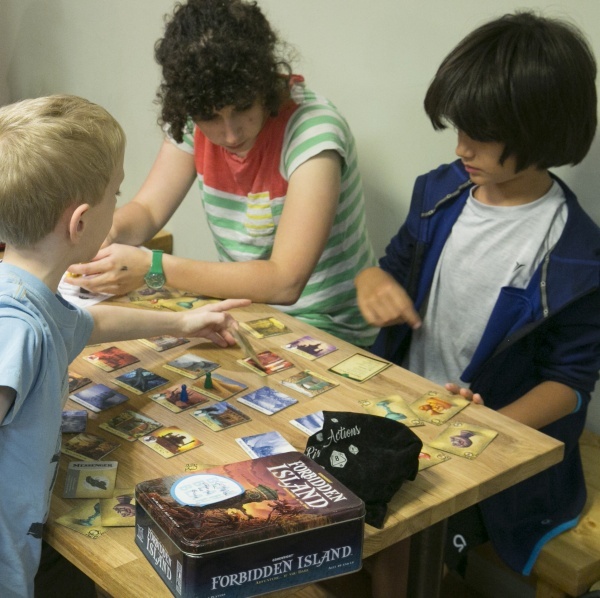 Board Games– campers may select age-appropriate games from our massive board game library. Afternoon groups explore different strategic approaches for game success and continue to focus on good sportsmanship. Lunch is included for Full Day campers. We make our campers’ lunch onsite in our cafe and serve items off our café menu. If your child has a dietary restriction, please send lunch as we do not have the capability to offer an alternative. If your child has an allergy or travels with an EpiPen, you must alert staff at drop-off and provide explicit written instruction on your child’s waiver. We offer bagged snacks (popcorn/potato chips/chex mix) in the morning and a home-baked sweet treat (usually a chocolate chip cookie), popsicle or fresh fruit in the afternoon. There is always water available and daily campers should bring a refillable water bottle. Week-long campers will receive a water bottle to use while they are here. You may want to send an additional snack if you have a hungry child. Our kids’ programs focus on instruction, developing strategies for game play and having fun! Kids learn how to think ‘moves ahead,’ anticipating an opponent’s reaction and developing good sportsmanship. After School Clubs are fun-filled and educational clubs that explore strategic thinking using board and card games. ASC are designed to encourage and allow beginner through experienced players. We arrange groups and games by age, category, skill and/or subject. We spend one week playing a new game, which involves instruction and strategies for game play. The second week is designed to allow participants to have a more in-depth experience by revisiting and reviewing the games, and exploring various strategies and novel problem solving skills. We then move on to a new set of games, in another two week series, through to the end of the session. REGISTER NOW – ONLINE REGISTRATION AVAILABLE! Spring 2018 Session: April 9 – June 22, 2018; 3:30pm – 5:30pm. Children can work on program related warm-ups, homework or play games from 3-3:30pm. Individual Class Days: If you would like to register for one class, you can do so. Each class is $45.00/session. Dependent upon seating availability. To register your child, please call our store at: 212-439-1008 or come in any time. SCHOOL PICKUPS: We pick up at individual school’s dismissal times. 6PM LATE PICKUP: Full Session $7.00 a session (amount varies based on number of sessions). Individually selected late pickup (selected by contacting Hex & Co directly) costs $10.00/day.